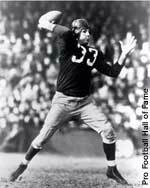 Sammy Baugh won a "triple crown" in 1943, leading the league in passing, punting and interceptions. The Cleveland Rams, with co-owners Reeves and Levy in the service, were granted permission to suspend operations for one season, April 6. Levy transferred his stock in the team to Reeves, April 16. The NFL adopted free substitution, April 7. The league also made the wearing of helmets mandatory and approved a 10-game schedule for all teams. Collins, who had wanted a franchise in Yankee Stadium in New York, named his new team in Boston the Yanks. Cleveland resumed operations. The Brooklyn Dodgers changed their name to the Tigers. Coaching from the bench was legalized, April 20. The Cardinals and the Steelers were granted permission to merge for one year under the name Card-Pitt, April 21. Phil Handler of the Cardinals and Walt Kiesling of the Steelers served as co-coaches. The merger automatically dissolved the last day of the season, December 3. In the NFL Championship Game, Green Bay defeated the New York Giants 14-7, December 17. Brooklyn and Boston merged into a team that played home games in both cities and was known simply as The Yanks. The team was coached by former Boston head coach Herb Kopf. In December, the Brooklyn franchise withdrew from the NFL to join the new All-America Football Conference; all the players on its active and reserve lists were assigned to The Yanks, who once again became the Boston Yanks. Halas rejoined the Bears late in the season after service with the U.S. Navy. Although Halas took over much of the coaching duties, Anderson and Johnsos remained the coaches of record throughout the season. Free substitution was withdrawn and substitutions were limited to no more than three men at a time. Forward passes were made automatically incomplete upon striking the goal posts, January 11. The NFL took on a truly national appearance for the first time when Reeves was granted permission by the league to move his NFL champion Rams to Los Angeles. Bill Dudley of the Steelers led the NFL in rushing, interceptions, and punt returns, and won the league's most valuable player award. Backs Frank Filchock and Merle Hapes of the Giants were questioned about an attempt by a New York man to fix the championship game with the Bears. Bell suspended Hapes but allowed Filchock to play; he played well, but Chicago won 24-14, December 15. A bonus choice was made for the first time in the NFL draft. One team each year would select the special choice before the first round began. The Chicago Bears won a lottery and the rights to the first choice and drafted back Bob Fenimore of Oklahoma A&M. The Cleveland Browns again won the AAFC title, defeating the New York Yankees 14-3. Halfback Fred Gehrke of the Los Angeles Rams painted horns on the Rams' helmets, the first modern helmet emblems in pro football. The Cleveland Browns won their third straight championship in the AAFC, going 14-0 and then defeating the Buffalo Bills 49-7. In a blizzard, the Eagles defeated the Cardinals 7-0 in the NFL Championship Game, December 19. The NFL had two 1,000-yard rushers in the same season for the first time-Steve Van Buren of Philadelphia and Tony Canadeo of Green Bay. The AAFC played its season with a one-division, seven-team format. On December 9, Bell announced a mer-ger agreement in which three AAFC franchises-Cleveland, San Francisco, and Baltimore-would join the NFL in 1950. The Browns won their fourth consecutive AAFC title, defeating the 49ers 21-7, December 11. Unlimited free substitution was restored, opening the way for the era of two platoons and specialization in pro football, January 20. Curly Lambeau, founder of the franchise and Green Bay's head coach since 1921, resigned under fire, February 1. The Los Angeles Rams became the first NFL team to have all of its games - both home and away - televised. The Washington Redskins followed the Rams in arranging to televise their games; other teams made deals to put selected games on television.